The Sussex Spaniel is a compact, family dog whose temperament is warm towards their family and friends. Where they are warm with the familiar company, they are suspicious towards strangers. This suspicion is famous with this breed, part of what makes them known for frequently howling, for a Spaniel. Typically well behaved with those they are comfortable with, these dogs make for great, relaxing companions. These dogs are ideal for owners with children. Their gentle and relaxed temperament pairs well with their size, creating playful and harmless pets. These dogs are more reluctant when meeting strangers, although, a socialized Sussex will be open to making new friends. This being said, both visitors and children should always be shown the proper way to handle the dog before playing with or petting it. The Sussex Spaniel is known for being a relatively noisy breed. This is natural, of course, and should be taken into consideration when considering getting one of these dogs. They will often bark at passersby as well as any unknown creatures on the property. As well as living things, these dogs are known to howl once they have picked up a scent. Altogether, they end up making a fair amount of noise, so they aren’t the best dogs for apartments or people with neighbors sensitive to high volumes. This breed is known to get along well with other canines. Of course, this is dependent on how much an individual dog is exposed to other dogs early on, but they generally coexist just fine. They are comfortable living with other dogs, though they may not appreciate the particularly gregarious company. Due to their relaxed lifestyle and size, a very large and energetic dog may not be the best type to share the house with. Unknown dogs are often treated with the same suspicious temperament felt by strangers. The Sussex Spaniel is a sensitive breed when it comes to how it is treated. This is important to consider while training, but altogether, the way their owners act with them will often be reflected in their behavior. To have a relaxed and enjoyable companion, they must have a relaxed and kind owner. While they are sensitive to treatment, they are hardy dogs regarding the elements. While they should obviously not be left in prolonged exposure to any weather or temperature, they typically handle heat and cold just fine. These dogs love to be with their families. When they are alone, they can get moody and restless. This can sometimes be expressed through bad behavior while alone, especially if they have an excess of energy. To prevent an excess of energy in these dogs from manifesting in negative behavior, owners can use the regular exercise required to maintain their health to double as a relaxant. 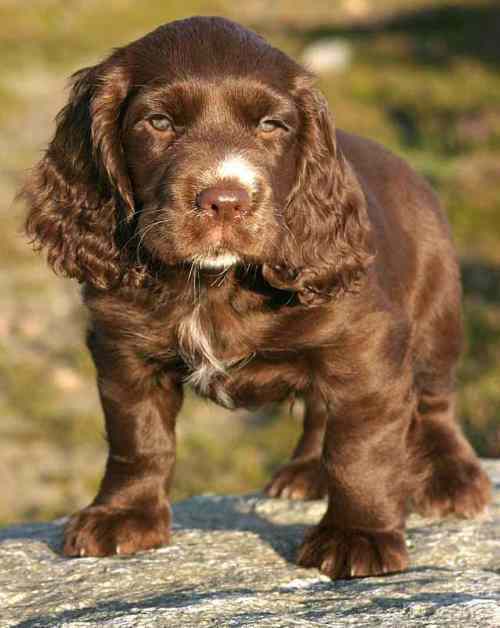 The history of the Sussex Spaniel begins in Sussex, England. While this member of the spaniel family is from England, spaniels themselves originated from elsewhere. The spaniel itself originated sensibly from Spain, likely the reason for the breed’s name. These dogs made their way out of Spain and around Europe probably through their travel alongside conquering Roman armies. The English Spaniel from which the Sussex Spaniel was bred became fairly well known as early as 300 AD. The ones we see today were more like those seen in the 16th and 17th centuries. It’s not known what these dogs may have done around this time, although, they may have assisted with hunting or guarding one’s property. In the later 18th century, gun dogs were becoming more accessible and standardized. It was around this time that the Sussex Spaniel was bred to a standard by Moses Woolland in 1882, with Campbell Newington breeding nearly identical Sussex's of his own in 1887. These two men created the base for the breed, although, after Woolland’s death, the breed faced the danger of extinction. In the early 1900s, Newington was assisted by a J.E. Kerr to help the breed survive. Unfortunately, due to their home being in England, this breeding was promptly interrupted by the arrival of WW1. This war put breeding on the backburner, leaving this mainly unknown breed primarily forgotten. Things didn’t improve after the war either, although a couple Sussex’s being brought to the US. WW2 was the same story for the breed, as their populations declined massively with few breeding attempts to compensate. With low popularity for the breed, they genuinely faced a serious threat of extinction. Luckily they held on, just barely. Joy Freer, in particular, is amongst those that kept this breed alive. In the US, the breed did not manage to draw much attention to itself. It had taken a while before they gained much popularity in the country, and to this day, they remain somewhat unknown. A couple was imported into the US in the early 1970s, with more following. Altogether, fans of this breed remained few and far between. The Sussex Spaniel is known for being a moderately difficult dog to breed. Due to their high sensitivity, the dog is typically very responsive. However, this can also be a negative as they will react poorly to harsh reprimands. Altogether, the recommended training method for this breed is to work with their personality, providing them with rewards and praise for good behavior instead of punishment for bad behavior. Housebreaking comes fairly quickly for dogs with the high intelligence and sensitivity such as the Sussex. However, their size makes early housebreaking a consistent process that the owner must be adamant about. Instead of reprimanding them for going to the bathroom inside of the house, it’s best to praise them when they go to the bathroom where they are supposed to. Aside from that, the dog fairly well behaves, and will happily coexist with its family and friends. A part of the training that is of particular importance with this breed is socialization. The Sussex Spaniel is notorious for its protective personality. Barking or howling at passersby and greeting strangers with suspicion, it is best to teach these dogs early off who are friends and who are not. Walking a Sussex regularly will help expose it to its environment and various sights smells and sounds. Early exposure to different things will leave the dog more comfortable in its habitat. The Sussex Spaniel is only known for having one coat color, golden liver. 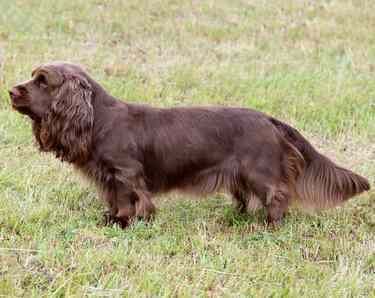 The Sussex Spaniel is well known for its luscious coat. This same hair is also known for getting matted quite quickly, so most owners of this breed will brush it at least every other day. While it needs regular brushing, this spaniel does not tend to get too dirty. Owners will typically just bathe them as they feel necessary, as well as after any swimming. It is also important to prevent cavities as well as mats. Brushing a dog’s teeth is a part of grooming that is often neglected, despite its importance. It is recommended that these dogs have their teeth brushed at least 2-3 times a week. Regular brushing will help keep their breath smelling fresher as well as prevent infections. This breed is especially prone to dental issues, so teeth brushing can not be overlooked. As with all dogs, the Sussex Spaniel will need its nails clipped too. Clipping a dog’s nails regularly is important, as otherwise they will grow too long, and may dig into the dog’s skin. To prevent this discomfort, owners will often clip their dog’s nails at least every 3 weeks. Most go by ear, however, as a good way to tell if a dog’s nails are too long is if they can be heard clicking against the ground as they move. With large floppy ears such as those found on the Sussex, it is especially important to check and clean this dog’s ears regularly. Due to the shape of the ear, there is often not enough airflow to prevent the buildup of bacteria. To prevent ear infections, owners will often check and clean their dog’s ears at least once a week. This regular cleaning will remove built up wax and bacteria that is stuck inside their ear. As you can probably imagine, a dog as small as the Sussex Spaniel is not going to be doing too much protecting, based on size alone. Their little build and athletic temperaments were used to keep up with their owners while they hunted, not hunt themselves. The loyalty of the breed may lead it to make a valiant effort towards protecting their owner should push come to shove, although, these dogs are definitely not ideal guard dogs. While their size and build prevent the Sussex Spaniel from protecting their owners physically, their noisy personality tends to do the trick. Alongside hunting, these dogs continue to be great at being capable of alerting their owners to a threat. They will bark and howl whenever there is something unusual around the property, so there’s a good chance they won’t have to put their poor guard dog skills to the test. Most owners will be made aware of an intruder’s presence early on. Being a watchdog seems to be the only protective ability up this breed’s alley. Their personalities make them protective of their owners, although, their bodies do not. Instead, they will happily make their owners as well as the rest of the neighborhood aware of when they find something unusual. All dogs are likely to get sick periodically just like humans. They need good health care that includes protection from parasites, periodical vaccinations, an excellent diet and a spay or neuter if they aren't going to be used for breeding purposes. Beyond that, different dog breeds are prone to certain genetic health problems that have been identified. Many of these inherited conditions can be now be identified through various tests that breeders do on their breeding dogs. Learn what health problems exit in the Sussex Spaniel.